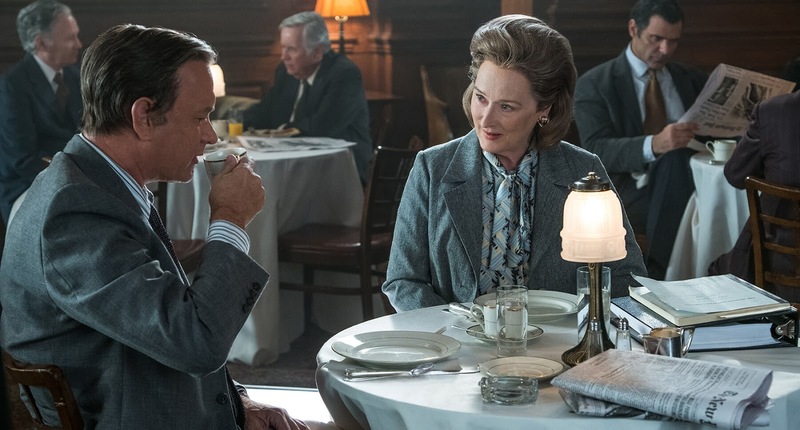 A journalistic drama, The Post is a familiar but still relevant story of press freedom. It's 1971 and the Vietnam War is grinding on. A disgruntled government contractor secretly makes copies of the Pentagon Papers, secretive voluminous reports about the war commissioned by Secretary of Defense Robert McNamara (Bruce Greenwood) in the mid 1960s. The Papers reveal a very different version of the truth than the official government narrative. Soon the New York Times is running front page stories much to the disgust of President Nixon, who issues a court order to stop the Times publishing any further revelations. 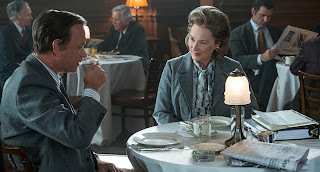 Over at the Washington Post editor Ben Bradlee (Tom Hanks) chases the story, while the Post's owner Kay Graham (Meryl Streep) is occupied with floating the paper on the stock exchange. Graham is also encountering near blatant sexism as Washington DC's elites dismiss her as an accidental owner of the paper with no real skill or talent to contribute. 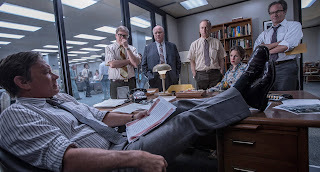 With help from senior reporter Ben Bagdikian (Bob Odenkirk) Bradlee finally gets his hands on the Pentagon Papers, but Graham will have to decide whether to risk the Post's future by agreeing to publish, a decision made all the more difficult by her friendship with McNamara. Directed and co-produced by Steven Spielberg, The Post was rushed into production as an antidote project to the attacks on the press emanating from the Trump White House. With Streep and Hanks representing the upper echelons of Hollywood royalty lending their considerable talents, this is a reasonably engaging but firmly conventional story about the mainstream media staring down government pressure and court orders to reveal the truth about an ongoing war. The film is earnest in its intentions but also blatantly preachy. 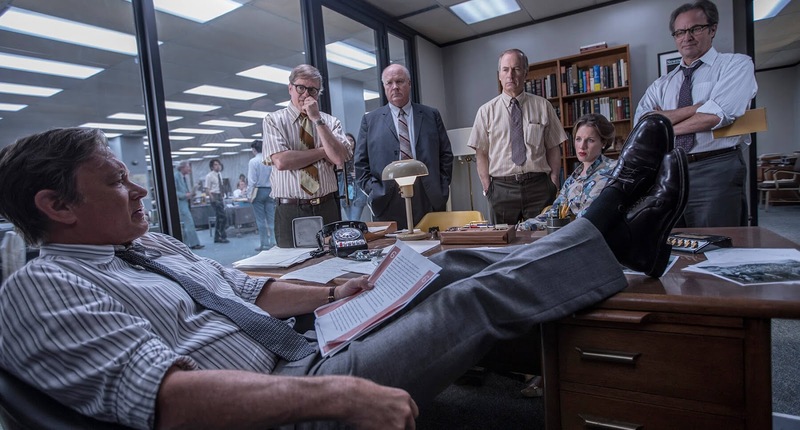 Slick and professional as it is in recreating a 1970s newsroom milieu and a society were men still determined every action, there is no escaping that The Post adds little to the press-versus-authority sub-genre. The terrain is already well-covered by the likes of All The President's Men, State Of Play, Spotlight and The Fifth Estate. Editors egging on their reporters who then work the phones, pound the sidewalk, track down their sources, and clack away at typewriters as the deadline approaches for the presses to run, all under pressure of dark and evil authoritarian forces, is overly familiar cinematic material. With the ending well known, the drama emanates from the day-to-day tactics and small sequential battles Bradlee and Graham had to personally and professionally wage and overcome. And Kay Graham's story is the one that resonates. With Meryl Streep in stellar form, the quiet struggle for a woman of considerable but theoretical influence to find her voice emerges as The Post's highlight. Spielberg expertly stages a succession of painful moments where Kay is marginalized, ignored and subjected to condescending behaviour by elderly white men in dark suits unaccustomed to a woman carrying and exerting decision-making authority. When it's finally her time to step forward and shape history, the societal seismic shock is profound. Despite a lack of originality in style and content, The Post still delivers an important story in a proficient package.